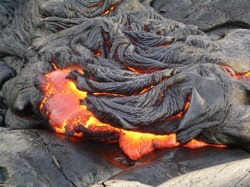 Welcome to the home page for the Hawaiian Volcanoes Field Course 2005 organized by a group of volcanologists and petrologists from the University of California campus in Davis and San Diego. On this website you can find practical information about the field trip itself, which courses are prerequisite, what to bring to Hawaii, where to register, etc. This site will be maintained to also report the findings of the participants in the form of daily reports and image galleries, and many other data products.